In most transaction negotiations the real estate broker represents the landlord or owner. If the broker has a written agency agreement with the owner, he has a legal obligation to represent the best interest of the owner and negotiate the best deal possible for him. If I’m providing you tenant representation, I have an obligation to negotiate the best possible deal for you. And typically, my fee will come from the landlord or owner, so my services cost you nothing. Market knowledge and how to best accommodate the unique needs of your business are the cornerstones of my tenant representation services. By consulting with you to learn about your plans, issues, budget and more I can apply my knowledge of the market and current trends to create an optimal transaction for you. By having me represent your interests you’ll be assured of knowing about all of the properties available. You’ll also know what existing tenants at those properties are paying. I will also give you critical insights into many important issues, such as how much you can expect the new owner to pay for construction of new improvements and how to recognize opportunities for negotiating more favorable terms into your new lease. I’ll find the best site for your needs, negotiate the best terms and prices possible and make sure your move goes smoothly. I can help you with many facets of the process, from help with relocating equipment to logistics and recommending architectural or design firms. 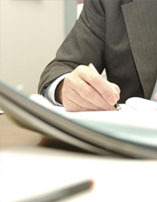 I’m an expert in tenant representation with a proven track record of representing both office and industrial clients. Once I’ve consulted with you to learn your objectives and needs, I’ll do a preliminary search of available properties. Then I’ll do a thorough analysis of each site, looking at all aspects of the properties, rates, terms and conditions. Then I’ll present you the best available options. As we proceed I’ll give you critical advice on issues pertaining to the lease negotiations and tenant improvements. I’d be happy to talk to you about the details of the process I’ll use to help you find your new facility and negotiate the best deal possible.